Guwahati: In a boost to counter-insurgency operation in Assam altogether 1695 militants belonging to nine insurgent groups based in the state including four Adivasi outfits laid down arms in the presence of Union Home Minister P Chidambaram here on Tuesday. The nine militant groups, which have laid down arms, included four Adivasi militant groups – Adivasi People’s Army (APA), Adivasi Cobra Military of Assam (ACMA), Birsa Commando Force (BCF), Santhal Tiger Force (STF), and All Adivasi National Liberation Army (AANLA). The rest of the militant groups include Hmar Peoples Convention (HPC-D), Kuki Liberation Army (KLA), Kuki Revolutionary Army (KRA) and United Kuki Defence Army (UKDA). The militants deposited assorted arms and ammunition during the surrender ceremony held at Indira Gandhi Stadium here. Welcoming militants to the path of peace and reconciliation, P Chidambaram said “Government of India always welcomes militants to the path of peace. We believe that in a democracy everybody’s voice has to be heard, everyone is entitled to live in peace and harmony and brotherhood. There is no problem that can’t be resolved through dialogue, no hurdle that can’t be crossed through talks and no knot that can’t be untied with patience. “I assure all of you who have laid down arms today that Government of India and Government of Assam will treat everyone of you as an equal citizen with honour and dignity. The past is behind us, we have to look forward to the future to build a great Indian nation and a great economy together,” Chidambaram said. Congratulating Assam chief minister Tarun Gogoi for the massive surrender of militants Chidambaram said “It would not have been possible without the leadership and statesmanship of Tarun Gogoi. About a year ago people of Assam reposed faith in Gogoi and his team by re-electing him. They reposed faith because they hoped Gogoi would lead the state to the path of peace and development. It has been proved that judgement and trust of people were not misplaced. Gogoi has redeemed the promised he had made to the people of Assam,” Chidambaram said. Gogoi said some of grievances of the militants like economic and social backwardness of their respective communities were genuine and would be looked into by the government. He renewed appeal to the anti-talks faction of the ULFA led by Paresh Barua to see the writing on the wall and come back to the path of peace otherwise the government will have to deal firmly with them. The surrender ceremony was also graced by GoC 4 Corps of Indian Army, Lt Gen Shakti Gurung, GoC 3 Corp Lt Gen Dalveer Singh , DG of Assam Police J N Choudhury, Joint Secretary of Union Home Ministry Sambhu Singh , Assam Home Commissioner J Baruah and senior officials of the CRPF, BSF and SSB. 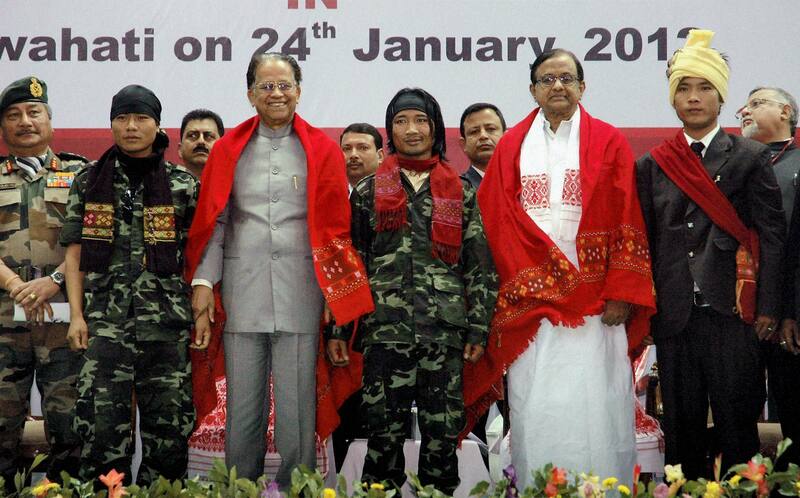 The leaders of the militants groups earlier felicitated both Union Home Minister P Chidambaram and Chief Minister Tarun Gogoi in traditional tribal way before laying down arms. They also submitted separate charters of demands to the Union Home Minister.